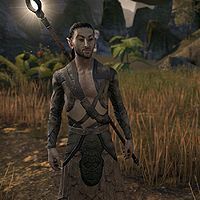 Indaenir is a Bosmer who plays an integral role in the Aldmeri Dominion quests in Greenshade and Malabal Tor. Shortly after the death of the current Silvenar, Edhelorn, Indaenir sacrifices himself to cleanse the blight from Valenwood. Following his sacrifice, he is revived by Y'ffre and becomes the successor to the Silvenar title. The Prisoner of Jathsogur: Free the Silvenar from the Drublog ritual. A Wedding to Attend: Meet the Silvenar in Silvenar, and attend his wedding. Restore the Silvenar: Defeat the Hound and observe the Silvenar's marriage to the Green Lady. Why would the villagers turn to the Nereids? "Desperation turns enemies into allies. The villagers knew General Malgoth and the Blackroot Clan were going to attack, and they knew they couldn't win. Likely, they asked the Nereids for help, and the Nereids convinced them this was the best course." Why did the Nereids even get involved? "Because it's in their nature. Death amuses them, and all the more when they can manipulate people into bringing about their own demise. As disasteful [sic] as it may be, the Nereids are part of the natural order. I just try to stay away from them." So you had heard of General Malgoth? "Of course. Malgoth sought to unite all the Bosmer under his leadership. He led the Blackroot Clan to conquer much of Valenwood during the Bosmer tribal wars. Then one day, the just disappeared. No one knew what happened...until now." What were the Bosmer tribal wars? "The Bosmer have always been free peoples, bound only to the Green. Rarely have the tribes united under singular leadership, although for a period many, like Malgoth, tried. Most of the so-called "wars" were not fought at all, but won by trickery." But General Malgoth was an exception? "Yes, General Malgoth had traveled far and wide. He had seen the greatness that comes to those who conquer through military might. That you'd not heard of him is a tribute to the sacrifice of the Vullain Bosmer." Not so different from Malgoth observing the Meat Mandate? "As barbaric as it seems, many clans still lived by the old traditions during the Bosmer tribal wars. Mind you, they didn't consume the bodies of the dead because they enjoyed the taste. It was a matter of tradition." And the Vullain villagers took advantage of that? "Apparently so. Though the tactics they embraced sound more like a Nereid plot than something the villagers themselves might have come up with on their own." The Right of Theft can even compel the dead? "For General Malgoth, that's apparently the case. For all his ambition, he was still a staunch traditionalist. It's actually quite impressive that his sense of honor remains intact even so many years after his death." How do you steal something from a dead person? "I'd say this is a perverted case. The value that Malgoth placed on his bow alone may be enough for him to want it back. Or, he may be using the Right of Theft as a more honorable justification for his new servitude. There was fear in his voice." "Did you hear the voice …? He called this the "Shadow Wood". It seems to be some dark realm that parallels Valenwood. If the Shade of Naemon has created this, he's more powerful than I realized. This is... horrifying." "We have to stop this… we have to destroy this "Shadow Wood", whatever it takes. There must be a focus here, something that ties this plane to ours… something… It's the bow! The general's bow. That has to be it." The Shade said it had the bow. "Yes, and we will have to confront it and take the bow back. That will release the general… and hopefully dispel this nightmare. There's also the spirits from the glimmers of the past we saw earlier. They are trapped here and we must release them." How can we release them? "It's the shadow rifts that bind them here. From this side, you need only to touch the rifts to close them. That will release the spirits from their torment and weaken Naemon's grip on this place. If you'll focus on that, I'll search for the Shade." All right. I'll go close the shadow rifts. "Unless you have questions of me, I will soon be on my way. We should both search the forest for other signs of Naemon's corruption. I fear at some point, we will have to confront Naemon himself." General Malgoth mentioned the "Ooze". What did he mean? "A spiritual prison, of a sort. Bosmer who break their oath to the Green Pact go there when they die. To reflect, for an eternity. There's a place called Ouze where we bring the bodies of Oathbreakers. Some think it's a physical link to the Ooze." "Long ago, before the Green Pact, the Standing Stones were used to protect the people from the aggression of the forest. If we can activate the stones, it could prevent the trees from spreading the blight to anyone else." All right. Let's activate the stones then. "If the Eldest has been corrupted, then everything in this area―every plant, every creature, and every person will soon become corrupted as well. I can't imagine how this blight can so easily penetrate the forest's protections." What exactly is the eldest? "It is an ancient plant―a strangler. It's been here from the beginning. It's the lifeblood of the forest in this area. If the Eldest is truly tainted, then regardless of the Green Pact, we must slay it." Killing the Eldest will violate the Green Pact? "I don't think so. We must consider the significance of the Green Pact as a whole. At its core, it's a covenant in which we protect the Green and the Green protects us. In this case, we must cut off the limb to save the trunk. It's the only way." Will it grow back after we kill it? "Not without assistance. After we've killed it, you must remove its heart. We may be able to use that to grow a new strangler to take the Eldest's place." "I'm relieved you're here, my friend. As dark as my fears may have been, they pale in comparison to the reality. If the Shade of Naemon corrupts the Heart of Valenwood, then the realm he calls the Shadow Wood will soon consume this one." How do we stop him then? "It won't be easy. They enchantments that once kept evil out of the way are now corrupted - it's something similar to the blight we saw in Verrant Morass, but much stronger. Every soldier who'se entered has turned feral. Even you and I would not be immune." Then how do we get in? "It's risky, but to defeat the darkness, we may have to embrace it first. The Green is corrupted, and I think I can use my connection with it to thrust me into the realm of the Shadow Wood. In that realm, I suspect we can get past the blight. " It's worth a try. Let's do it. "There. We're in the Shadow Wood again, as foul as it ever was. We should be able to bypass the blight though ... and all the feral guardians that would block our way. Once we get in there, we need to head to the Grotto - that's where the heart is." You think it's safe to go in then? "There's only one way to find out, isn't there? If we go feral, that's that. If not, I still suspect we'll encounter some resistance. The Shadow Wood hasn't lacked for corrupted spirits elsewhere, and I can't imagine it will here, either." All right. Let's go then. On quests where Indaenir acts as a follower, you may see Vinedusk Rangers or Forest Spirits following other players in his place. This page was last modified on 29 December 2018, at 02:18.